Buy Nimbasa City Post a Coffee. ko-fi.com/nimbasacity - Ko-fi ❤️ Where creators get paid by fans, with a 'Buy Me a Coffee' button. Your Pokemon VGC Information Station. We exist solely to help players gain a better understanding of the VGC metagame and where it's heading. Donations are never required but are simply meant to be a way to financially show support to the work on our website and keep ads from messing with the flow of the website. Secured Payments. 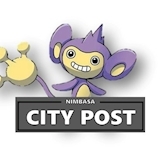 Support goes to Nimbasa City Post's account. Upgrade Nimbasa City Post to a yearly Gold Membership with a one-time payment.